When I asked Paul how he got into flying he said, "It was both easy and hard." Paul had decided to become a pilot when he was five-years old. Actually, per his dad's recollection, Paul first wanted to become an astronaut. But when he'd learned that astronauts only flew once every few years he asked his dad how often pilots flew. When his dad told him, "every day" he said, "I'm going to be one." He tells me, "I never changed my mind." Karlene: Paul, you've faced a few challenges in the pursuit of your flying dream. Not unlike many the struggles were many. Can you tell me about them? Paul: The problem was that I was growing up in England in the 1960's and 1970's, in a family with no prior involvement in aviation, and no knowledge of it. My dad worked for British Rail, and during the early 1970's, to combat inflation running about 30%, the government froze all wages of state-owned businesses, which included my dad. So while our neighbors were getting large pay increases to keep up with inflation, we did not and had no extra money for frivolities. Karlene: That must have been a huge challenge. So tell me how you fed your thirst for aviation if you couldn't fly. Paul: Much of the segment of the UK that are interested in aviation, but don't actually fly, do something called plane spotting. You can buy a book containing all the currently registered aircraft in the great Britain, and most of the visiting airlines. The idea is to hang out at airports, and try to check off as many individual aircraft spotted as possible. It's really a way to vicariously be involved in aviation, but not having the money to do it for real. Spotters know a lot about aircraft and airlines, but rarely (at that time at least) get airborne. I was a spotter, and spent days at various airports just watching, checking registrations, and taking photographs. Karlene: Did you ever go for a flight as a youngster? Paul: During my childhood I only flew twice. Once in 1967 (I was 9). We flew on a charter flight to Canada to visit my uncle in Montreal. Everyone else flew the Atlantic on jets, we flew on a Bristol Britannia (4 prop_ owned by Caledonian Airways. In 1973 (15 yrs old) I got to fly over my house in a Cessna 172, organized by one of my teachers who belonged to a flying club. Karlene: That teacher needs a huge pat on the back. So what about college? Paul: In 1976, I left to go to college in London, studying Air Transport Engineering (the closest I could get to an airliner at the time), leaving my parents in an empty house. At the time in the UK, the only routes to commercial aviation I knew of were through the RAF or through British Airways pilot training. European airlines then either hired from the military, or trained their own pilots in their own school, out of high school or universities. Both required 20/20 uncorrected vision, which I didn't have. There were some private pilots, but not many - the cost to fly in the UK was (and still is) many times higher than in the US. The course I was in was mostly run for the benefit of British Airways, who had 15 of the 20 slots. Paul: I was the only other British student, being sponsored by Dan-Air, the #3 UK airline at the time. The rest came from overseas. When no at college, I worked in the maintenance hangars, and on the line at London's Gatwick airport - I believe we did some contract maintenance for Braniff. The main airliner I worked on was the DH Comet 4, but sometimes Boeing 727s and Canadair CL-44 and the occasional 707. While at college, I joined a gliding club, flying out of the North Weald, an old World War 2 fighter station North East of London, but I didn't get far due to lack of money and time. Karlene: That's amazing. I was a second officer for Braniff on the 727. To imagine that you worked on the plane that I possibly flew is amazing. Thank you for keeping us safe. So, I understand that a great tragedy occurred in your family. Paul: In 1974 my younger sister, Elizabeth, died of Leukemia age 13. With me away at college, when a recruiter offered my dad a chance to take a job in America, they jumped at the change to start over again, moving to Erie Pennsylvania in May 1977. I finished my degree in 1981, having done my theses in the combustion of synthetic fuels in gas turbines - a hot subject in the early 80s and now heating up again. 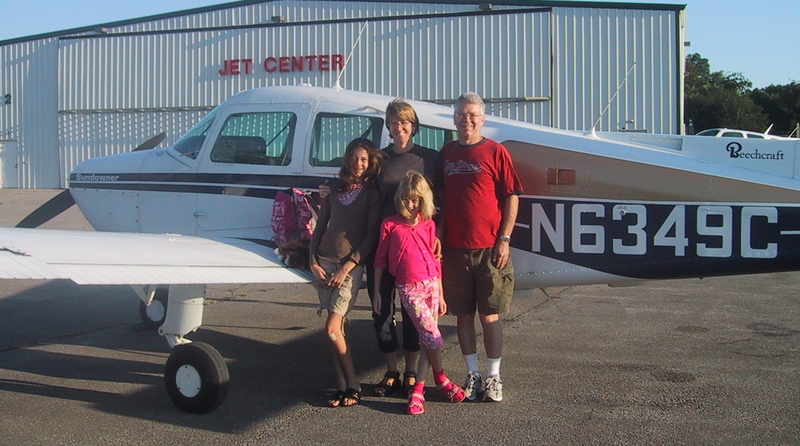 I moved to Erie PA, and with engineering job at GE improving the combustion of fuels in diesel locomotives, I finally had the money to start to fly in a rented Cessna 152. Unfortunately, with the Eire winter and being laid off from GE the next spring, I only just got as far as soloing before having to stop. Karlene: I'm sorry for the loss of your sister. Her passing definitely changed the direction for you and your family. So you had to stop flying. What next? Paul: I found a new job in Dallas, and started to fly out of Love Field. I well remember one early solo flight, when I made my final approach to 13L at full power and 125 kts because there was a Southwest Airlines 737 behind... Shortly after that the school shut down, so I moved to Addison, and started again. I had just soloed (again) and done my first cross-country when it happened - I got a girl friend. Paul: For several years all my money and spare time went in other directions --- buying a boat, skiing, going on dates, buying a house -until finally in 1992 I had a steady girlfriend (now my wife), lived in a house, owned my cars, etc., and I decided to finish my license. I enrolled at a school at Addison airport, and with my instructor (who I would love to catch up with - her name was Francine Friend, and she was planning on becoming a corporate pilot.) I worked out a tailored plan to get my remaining cross-countries done and get ready for the test. I go my private license in October 1992, and in 1998 I went back to gliders and got a glider add-on as well. Karlene: So you got your license. You got married. You started flying gliders. Sounds like the aviation career was taking off. Paul: I didn't fly much after that. My two daughters were born, and then in 1999 my company (Nortel) asked me to go back to the UK to help launch 3G in Europe. I had moved from engineering into marketing, and from locomotives into wireless telecommunications. The cost to fly in the UK was staggering, so I didn't. The next year, a start up in Massachusetts recruited me to help develop an advanced form of 3G called EVDO, now used by Sprint, Verizon, and MetroPCS in the US. So we came back to America, living under the downwind leg of Boire Firled in Nashua NH. 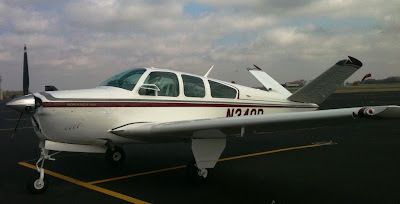 I finally had some spare money from selling my house in the UK, and started to look at buying an airplane - I had my eye on a 1977- Beechcraft Sundowner based at the airport, but I couldn't move fast enough, and I lost it. Finally in May 2006, after selling some shares I could afford to buy one, and found a 1981 Sundowner (N6349C) in Huntsville AL with the right avionics to allow me to pursue an instrument rating. Along with my brother-in-law, we flew to Hunstville and then flew my new airplane to Nashua, stopping in Erie PA to visit my parents. I didn't stay in Nashua. We wanted to move back to Dallas, and did so in August 2006. Fortunately I had a business trip to Boston that October, and instead of taking the return flight on American I drove up to Nashua, and flew 49C to McKinney airport (much more satisfying). 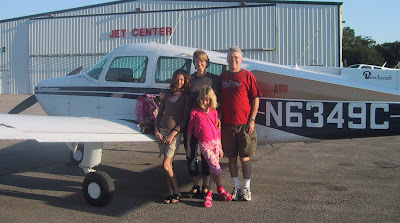 I signed up for lessons, and in the fall of 2007 got an instrument rating, and in early 2010, after many delays, completed my commercial rating. Now being legally a commercial, instrument pilot, even in not actually employed as one, was a very satisfying moment. Karlene: Congratulations on your success in completing your ratings. You prove that despite all controversy that anything is possible. But, I know aviation isn't your only career. Want to tell us what you do in your other life? Paul: My other career is in mobile telecommunications. Paul: I frequently speak at conferences, mostly now on the opportunities for delivering the Mobile Internet over 4G. Being an 'engineer with social skills' allows me to travel the world on someone else's nickel, and puts enough money in my pocket to fee my aviation addiction. I decided I would become an instructor, and when retired from telecoms in about 10 years, I would teach flying, but this year, I saw an ad fr American Flyers that offered both the CFI-Airplane and CFI-Instruments for only $3000, and having the money to spare I signed up. I took 4 weeks' vacation and finished with both instructor licenses, plus the ground instructor Advanced and Instrument licenses as well. By sheer chance, I had just bought a new, bigger and faster airplane, a 1967 Beechcraft V35A Bonanza (N340D), but hadn't managed to sell my Sundowner yet - which meant I had the 2 perfect airplanes needed to do the tests. 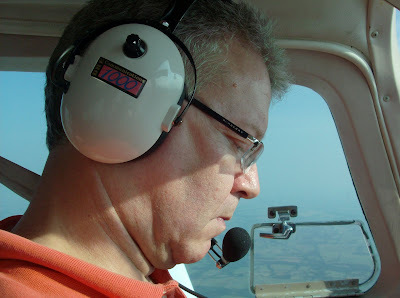 In May 2011 I passed the CFI-I test in 6349C, and in June the CFI-A test in 340D. Karlene: Congratulation on your ratings. Have you been teaching much? Paul: I now have several students, one is an accomplished airplane pilot who wants to start flying Bonanzas and needs a BFR, one is a private pilot working on commercial who wants a complex endorsement, and another is a private pilot doing instruments in his Sundowner. My own Sundowner recently sold, and is now living in Central Ohio (yes, airplane "live"). Last month I was laid off, so any extra income from flying is nice to have, I'm looking for a job, and at the same time trying to get a start up funded. If I get funding, I will have created my own job - We have the rights to some interesting wireless technology that I think could become 5G (wireless technology is kind of stalled at 4G right now), but I need about $1 million to prove it... Any takers? Karlene: Before we find you your million dollars - which if I had I would invest in you - what type of job are you interested in? Paul: I'm looking for a senior product management, marketing or business development job in wireless communications. See my Linked in Profile below. Any interested party to hire me, or fun my start up can send me an email to Paul.Sergeant@yahoo.com I'll also take short term flying jobs (ferry pilot). Paul shared a fun fact. Sue, his wife, - alias Sally on his blog - is slightly taller than Paul who is 6 feet tall. She also happens to be one of the shortest in her family while Paul is the tallest in his. He and Sue have two beautiful daughters, Sammi (16) and Vicki (12). But Paul refers to them as Thing one and Thing two in his blog ... DBCooper-theblog.blogspot.com. He loves to write and has many interesting things to say. Please join Paul on LinkedIn. Paul, nothing will stop you from your dreams. I hope you find that finance for your 5G-technology project, or the job of your dreams. Until then keep flying. Thank you very much for sharing passionate story　of him,Karlene san!! I love his passion,and am inspired by his passion. Thank you Jun for the nice comment. He just never gives up. I know you won't either. It's amazing what little kids are capable of. He was pretty smart... makes sense, to only do something you love once every 3 years. Oh... my. Talk about tenacity in overcoming adversity - I wouldn't bete against him on his start-up idea. What a grand effort; I applaud your success. Tenacity is the best way to describe Paul! Thanks for your comment Ross. I'm so fortunate to get to know you both. Update: I found a new job in wireless telecommunications after only 12 weeks "on the dole". I continue to teach aspiring pilots on the weekends. The startup is stalled right now, due to some IPR issues, but still simmering on the "back burner" and waiting for appropriate funding. Congratulations D.B.!! I am so happy for you!!! You have the best of both worlds. The simmering stew always comes out the best!